A taste of the Windy City in a bite-sized pizza. In a stand mixer bowl, combine flour, baking soda and salt using a dough hook. Add the honey, vegetable oil, water and beer. Mix on medium speed for 8 minutes, until a ball forms and the bowl is clean. Divide the dough into 24 pieces. Lightly coat 2 12-cup muffin pans with cooking spray. 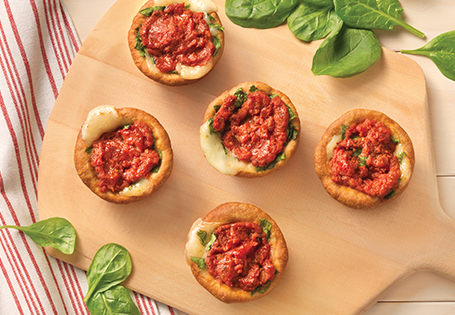 Place pizza dough into muffin cups, spreading it up the sides. Top each pizza with 2 slices of mozzarella and 2 slices of pepper jack cheese, alternating with each slice. Top each pizza with 1 teaspoon of turkey sausage, 1 teaspoon of spinach and 1 tablespoon of sauce. Bake for 20 minutes or until the crust pulls away from the sides of the pan. Serve with your favorite pizza garnishes, such as crushed red pepper flakes, grated parmesan or oregano.